Rock Cornish game hens are small, young chickens of a special breed. They have less meat than other chickens and so generally one Cornish hen equals one serving. Although there is some debate as to whom the credit is due for creating this mixed poultry variety, the goals seemed to have been the same: To develop a bird that was mostly white meat, was a single serving, and would appeal to a gourmet palate. 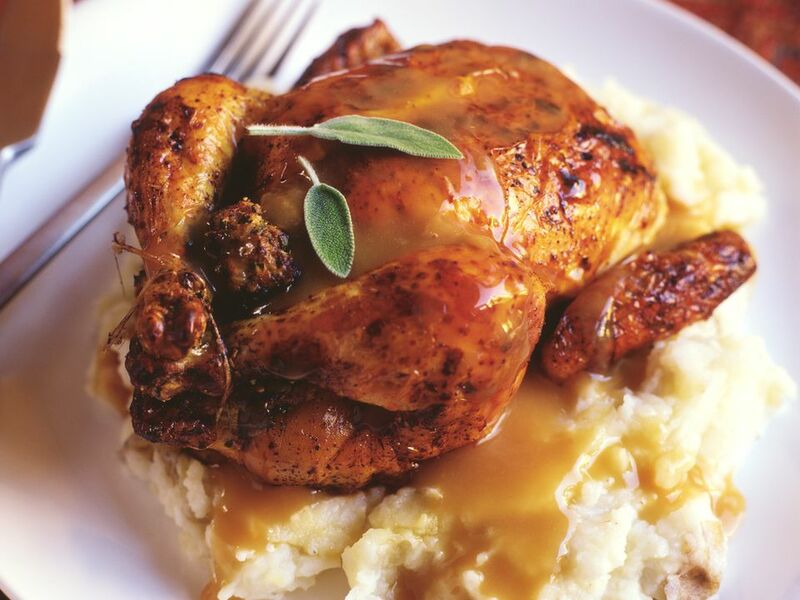 ​​Since a Cornish hen is a small chicken it can be cooked similarly to a whole roaster with a shorter cooking time. Many markets carry fresh Cornish hens ready to cook. Choose hens that look plump and meaty, with unbroken, smooth, unblemished skin. The color of the bird may vary—it can range from white to yellow, depending on the bird's diet. Markets that do not carry fresh game hens will have frozen ones in the freezer case, usually sold in pairs, in the meat department along with turkeys and wild game. Some stores will have thawed, previously frozen birds. If you do purchase a Cornish hen that has been prepared this way, you will need to follow some guidance when storing and cooking. If you buy a fresh Cornish hen, you should plan on cooking or freezing it within 24 hours. If cooking the hen, place in the refrigerator and then remove it about an hour before cooking to come to room temperature. To freeze fresh game hens, remove the giblets (a bag containing the liver, gizzard, and heart), and wash and pat dry before wrapping in an airtight package with all the air removed. If this is done properly, the Cornish hens can be stored in the freezer at 0 F for 6 to 9 months. Cooked Cornish hens can be refrigerated for up to 3 days or frozen up to 1 month. Frozen game hens should be allowed sufficient time to thaw in the refrigerator before cooking—this can take up to a day. You can also place the hen in a cold water bath; although this results in a shorter thawing time than refrigeration, it does require more attention. First, you need to make sure the Cornish hen is sealed in a leak-proof package; the liquid can make the meat watery if absorbed, and there is a risk of bacteria from the air entering the hen. Second, you need to change the water every 30 minutes to maintain a cold temperature. Placing meat or poultry in hot water or on the counter are unsafe methods for defrosting as they may lead to foodborne illnesses; bacteria that may have been present before freezing can begin to multiply. If you purchased a previously frozen-thawed Cornish hen, it is very important to cook it as soon as possible since you have no way of knowing how long the birds have been defrosted. According to the USDA, it is safe to re-freeze thawed poultry as long as it has constantly been kept under 40 F. Since you don't know the full range of conditions of a store-bought previously-frozen thawed hen, however, it is best not to re-freeze previously-thawed hens.